The Woven Handbag is one of the biggest trends for Spring and Summer this year. 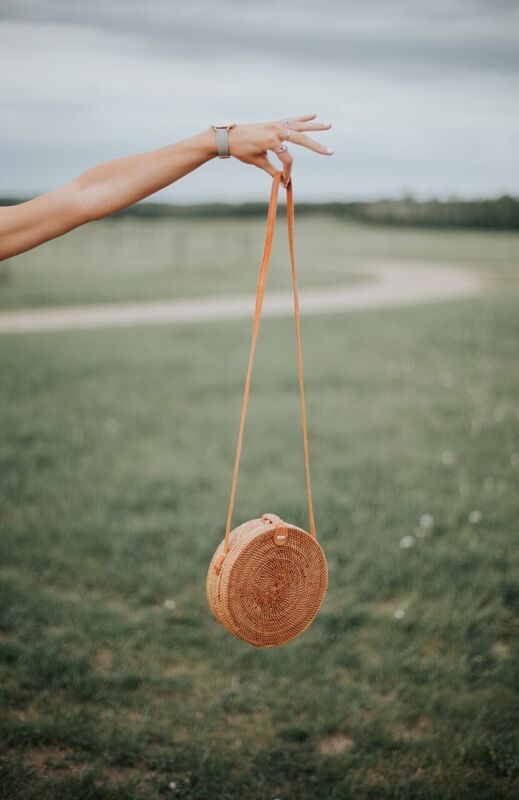 Whether they are made from wicker, straw or bamboo, these natural fibre bags have been woven into all kinds of stylish shapes and sizes…such as, large oversized totes, small boxy clutches or my favourite, round style with a cross body strap (pictured above) that was handcrafted in Bali. This handbag style has been pretty hard to miss as just about every top fashion influencer has been seen sporting a form of the natural accessory. It has also been featured on large fashion media platforms from Vogue to Glamour – AND WITH GOOD REASON!! These chic handbags offer a definite flareto your summer wardrobe and as a big fan of versatile items…it’s great to see a trend that can actually be worn with pretty much any of your warm weather outfits. You can pair the handbag with a flirty summer dress pictured here or with a more structured blouse and denim pictured here or even with a romper or linen pantsuit pictured here and here. I absolutely LOVE the look of natural fibre accents being added to daily staples – such as, jeans and a white shirt. It gives a bit of boho flare to an otherwise simple outfit, ESPECIALLY if there is a pop of colour added to the mixture – easily done using other accessories. Good news is, the bag of the moment can be found at several different locations for a range of prices. Although, I have to say the retailers Anthropologie and Free People offer my favourite selection. Their products are well-made but still remain at a reasonable price, averaging around $80 – $150. I definitely don’t see this wicker bag trend going away for quite a while. It is just such an easy and affordable item that I am really looking forward to wearing a lot this summer season! Interested in the woven handbag trend? Shop my favourites below!